But I’m not fond of deer. Noshing on my blooming treasure. They won’t stray from my garden buffet. It’s their favorite hang-out café. Those doey eyes out of story books. Or sneak around in the dead of night. They have a culinary ball. They eat my evergreens down to a splinter. I’m tired of providing your daily feasts. And you’re still coming back for tasty crumbs. Of my precious garden plot. Trot back to your own forest lot. But boo hoo on that old sob story. I don’t even eat your meat, I dare say. And leave my flowers to the birds and bees. You will not replace our Christmas goose. Then it’s roasted venison for the holidays! I'm right there with you. 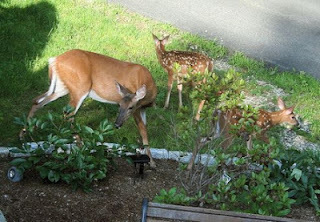 Last week, seven of them were playing chase in my yard digging their little hooves into my grass. This is after devouring the pansies.